13 March 1928: At Hamilton, Ontario, Canada, Miss Eileen M. Vollick passed her flight test in a Curtiss JN-4 Canuck, and was issued license number 77. 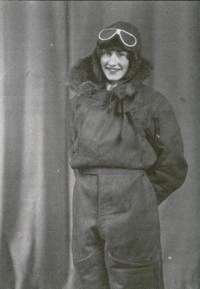 She was the first woman licensed as a pilot in Canada. “Opportunity” was calling in a thousand forms, in a new and thrilling and expanding industry- viz-commercial aviation, and I felt the urge to fly, to become a pioneer and blaze the trail for the women of my country. 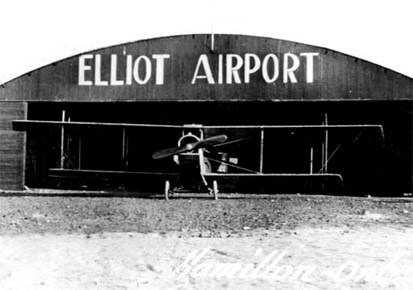 Early in March, 1927, Jack V. Elliot, pioneer of commercial aviation in Canada, opened his school and clubhouse at a place called Ghent’s Crossing, overlooking Hamilton Bay. The story of that flying school and clubhouse, the first of its kind in the Dominion, will be handed down to posterity, not only on account of its pioneer proprietor, but for the reason that in the pages of Canadian Aeronautical history will be found the names of young men and incidentally one woman, whose vocations were founded on faith and the future destiny of aviation in our country’s commercial life. I proposed to learn to fly, and fearful of being turned down or laughed at (women had not then entered into this man’s game in Canada.) I hesitated, wondering how much courage or talent was required to fly an airplane. I have never been afraid to go after anything I wanted and to stay until I got it, so, as “the whispering voices”ne day I ventured into the proprietor’s den, and asked him: — “Can a girl learn to fly.” He simply smiled, thinking doubtless I was looking for a thrill, but I soon convinced him I was in earnest, and later I met the Controller of Civil Aviation, Flt. Lieut. A. T. Cowley of Ottawa, who advised me to write the Government for permission to learn to fly commercially, no woman in Canada had previously made such application, and Mr. Elliot was doubtful of my success. 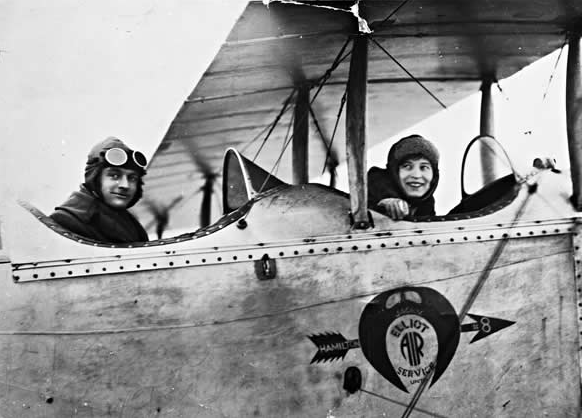 However, on June 14th, 1927, I was advised from Ottawa that the matter had been fully considered and in future certificates would be granted to women providing they passed the necessary tests and had reached the age of 19 years, and though it was through my efforts women were admitted into the flying game at Ottawa, had I not been first, some other enterprising girl would have paved the way to put Canadian women on a par with other countries. I was only 18 years old at that time and could not qualify but with the official benediction over my head I made arrangements with Mr. Elliot and became an ardent disciple of his school. The instruction planes at the Elliot Air Service have a dual control and by means of specially constructed earphones on the helmet the pilot gives his instructions to the student flyer. My first flight in the air was an epoch of my life never to be forgotten, no matter what I may achieve in the future the exhilaration of that flight will linger when all others are merely an event. The pilot who took me aloft thought he would either frighten me or find out how much courage I possessed, for though it is against the rules to “stunt” with a passenger, it is of great value for a student and a necessary adjunctive. By “stunts” I mean “spins,” “loops,” “zooms,” all very thrilling and decidedly the acid test for a new flyer, and I got mine for half an hour, satisfying my instructor as to my flying ability. Aviation always had a fascination for me even before I realized what a great thing had been accomplished when a motor driven vehicle could be propelled at great speed through the air, and when I actually became an active member in the field my enthusiasm knew no bounds. I must mention my first instructor Pilot Earl Jellison, under whose guidance I stored away knowledge which later proved invaluable. Writing from Vancouver where he was stationed Pilot Jellison sent congratulations on my success and wrote as follows: “I was very pleased with your ability last summer, and I think you know something of the confidence I had in you when you walked out on the wing to do your famous ‘parachute jump’ into Hamilton Bay.” This incident happened soon after I started to fly, and it takes a great deal of confidence to walk the wing of an airplane and jump into space, especially when the controls are in the hands of a strange pilot, but I felt no fear and evidently he felt none. A flyer must never make acquaintance with “fear” if he or she wants to become a successful pilot. I have never felt afraid, flying high or low, over land or water, and though I began my flying lessons in summer it was off the ice on Hamilton Bay that I took my solo flight, and passed the government tests. As a proof that my sense of “fear” is small, when I took the parachute jump from the wing of the plane into the waters of Hamilton Bay, from an altitude of 2,800 feet, it was a record, being the first Canadian girl to leap from a plane into water. Parachute work, however, was not my ambition. I wanted to fly. The summer months passed too quickly. October came, and flying days were drawing to a close at the airport. Soon, the family of cadets would move from the Beach to the city . . . The first week of the New Year saw me down at the winter quarters, situated at the extreme end of Hamilton Bay, in the north section of the city. And I began the most strenuous hard work I have done during the nineteen years of my life. The oracle of “early morning flying” is an open sesame if the student-flyer wants to become a real success, and after several flights off the ice on Hamilton Bay, I made arrangements with my instructor Pilot Richard Turner, to fly as early as possible. This necessitated some of the mechanical crew being down at the airport long before the sun rose in the horizon to fuel the plane and warm up the motor ready for flight. It is said that an aviator or aviatrix must be ready at all times day or night whenever a call comes, and this creed is thoroughly instilled into the minds of each student. So up in the morning early, long before the streets were warmed I left my cosy cot, drove my faithful old Ford down to the airport, donned a flying-suit and with the tang of ice and frost upon pilot, plane and student, we rose from the hardened ground, and winged our way over the icy Bay, across the cold waters of Lake Ontario, back to the city, then after “landing” and “rising” several times, we flew back to port, full of early morning pep, which the sluggard abed can never fully comprehend. Once more aboard my car and back home to breakfast. Eight a. m. found me on my way to the Hamilton Cotton Co., where I was textile analyst and an assistant designer. 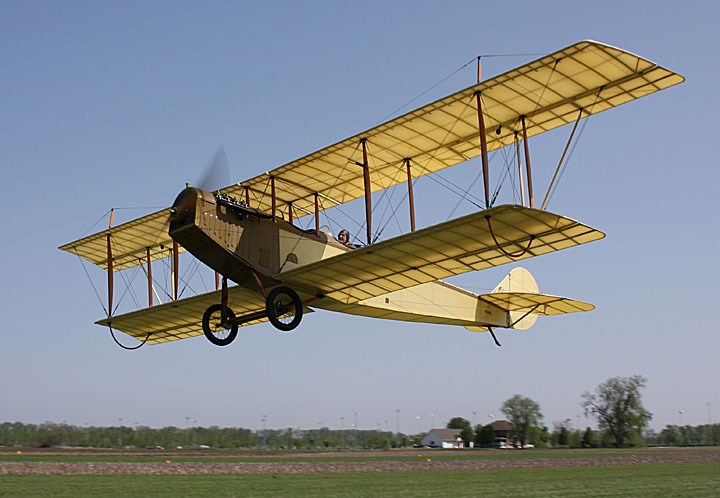 Flying is, and always will be, my uppermost thought, yet I never neglected my duties at the office, and when Alan V. Young, President of the Cotton Co. gave me leave of absence to try my examination tests, the time off had been well earned. Flying in the air is not the only qualification for a pilot, he or she must have a theoretical as well as a mechanical knowledge of aircraft. Lectures for students are given three times weekly at night and students must attend regularly or lose some important part of their training. I never missed a lecture, in fact when the Aero-Club of Hamilton started their lectures at the Technical School, I made a point to attend both. I was out for knowledge on aircraft. Performance is the supreme test, and the time was drawing close when I had to prove my worth or fall down in my tracks. I was ready for a cross-country flight, which is one of the government requirements. Tuesday, February 28th, was a bright, clear, cold day, ideal flying weather, and I was bound on a glorious adventure, my cross-country test flight. Accompanied by Pilot R. Turner, we left Hamilton early in the morning, arrived at St. Thomas; landed safely at McManus Field, refuelled the plane and took off for Hamilton, completing the round trip in 2 hours and 25 minutes. After more landings, a lesson or two on the use of skiis . . . and the eventful day finished. The government inspector had arrived and the cadets waited anxiously. Before a license can be issued, the pilot must make four landings, from a height of 1,500 feet, within 150 feet of a spot designated on the ground, one landing from 5,000 feet with the motor shut off, five figure 8 (eight) turns between two designated marks, and a 175-miles cross-country flight. 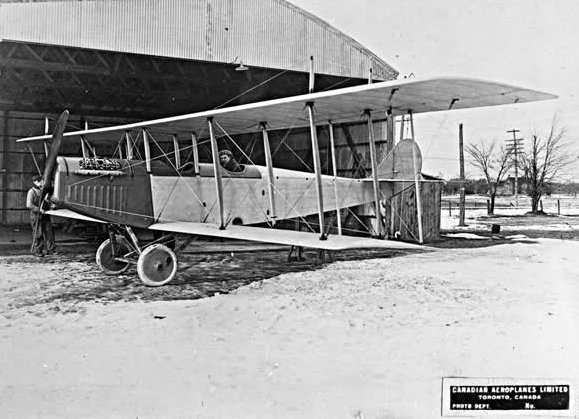 The day previous to the tests I had the extreme pleasure of taking Captain G. B. Holmes, Government Inspector, for a flight, and he gave me great credit for the able manner in which I handled the plane. On March 13, 1928, (lucky day for me) along with ten other cadets of the Elliot Flying School, I successfully passed the Government Civil Aviation examination, making three three-point landings on the ice with skiis, in place of wheels, to the utmost satisfaction of Captain Holmes, and the hearty congratulations of my instructors, and fellow students. They give credit, these loyal air-men, for having an iron nerve, and skill of an old war time pilot, “nerve” is a natural gift from God. “Skill,” I owe to my instructors, I have had three of whom I cannot speak too highly, Pilots Earl Jellison, Lennard Tripp, and Richard Turner whose invaluable assiduous instruction and help, enabled me to earn the proud title of “Canada’s First Licensed Woman Pilot” and made my dreams come true. Mary Eileen Vane Riley ¹ was born 2 August 1908 at Wiarton, Ontario, Dominion of Canada. She was the daughter of James Henry Riley, a laborer, and Marie Baynes Riley. Mr. Riley was killed in an accident in 1911. Mrs. Riley then married George Vollick. Miss Riley was known by her stepfather’s family name. She would have three step-siblings. Eileen Vollick attended St. Patrick’s High School in Hamilton, Ontario, then worked as a materials analyst for the Hamilton Cotton Company. Miss Vollick was 5 feet, 0 inches (1.52 meters) tall with brown hair and eyes, and a medium complexion. On 28 September 1929, Miss Vollick married James Hopkin, a steamfitter who had been born in Scotland. The Hopkins moved to Elmhurst, Long Island, New York. They would have two daughters, Eileen and Audrey. Eileen Vollick, as she is best known, died in 1968. She was buried at the Woodlawn Cemetery, Bronx, New York. ¹ Also known as Reilly. She used that version of the surname on an immigration document as she entered the United States the day following her marriage. She also stated that she was unaccompanied; marked “S.”, indicating that she was single (unmarried); and listed her new husband as a “friend” whom she planned to visit in Elmhurst, Long Island, New York.